Have you seen the Maxi-Peel TV commercial recently where there's a girl, visibly with pimples, is inviting the viewers to follow her journey into getting rid of her pimples using Maxi-Peel? 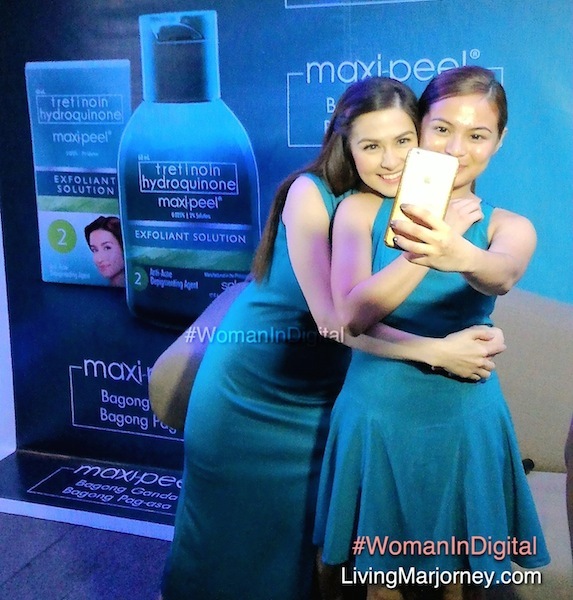 Well, we met her yesterday in a press conference organized by the exfoliant solution brand Maxi-Peel. 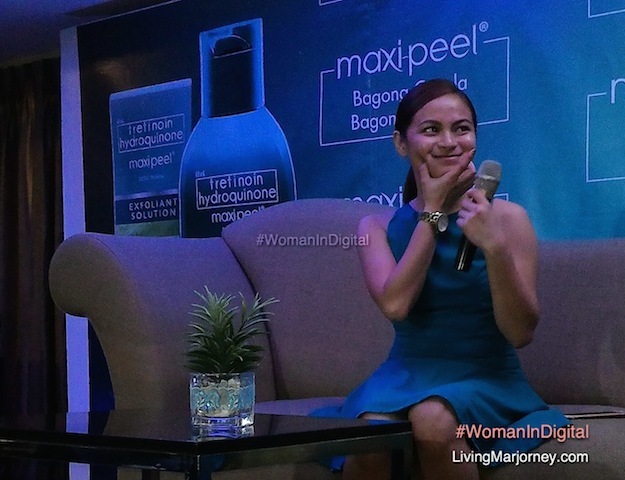 It turns out that she started her journey last April 1 which means she was on her 7th day of using Maxi-Peel products. Obviously, she has fewer pimples now compared to when she started which implies the effectivity of the product day and night regimen. Admittedly, I've got my own share of pimples and acne from time-to-time and most specially during our teenage years. but now I'm in my 30+, it usually pops up durng the "monthly period". 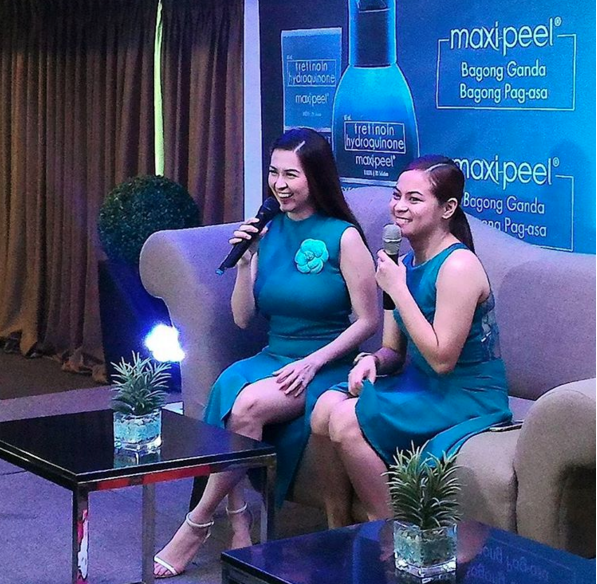 With the mission of delivering on the promise of clearer, blemish-free, fairer skin since Maxi-Peel was launched in 2001. As one at the leaders in the skin care industry. Maxi-Peel has taken bold moves in moving the category forward. In the past years, it has shifted towards the beauty advertising that features real women, who have successfully tried the Maxi-Peel regimen and are proud to shore their journeys and their stories in order to inspire other women who are undergoing the same skin problems. 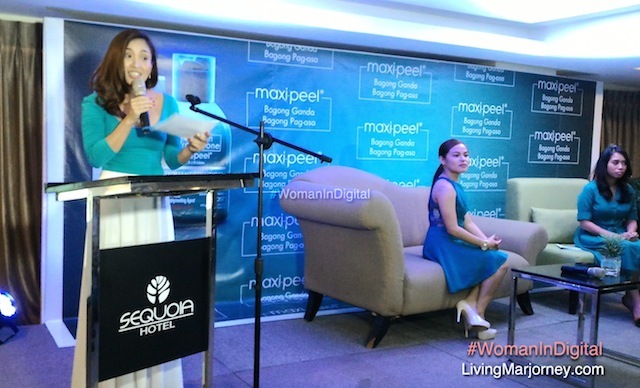 This year, Maxi-Peel pushes the envelope forward and further by launching the country's first ever TunaySerye. 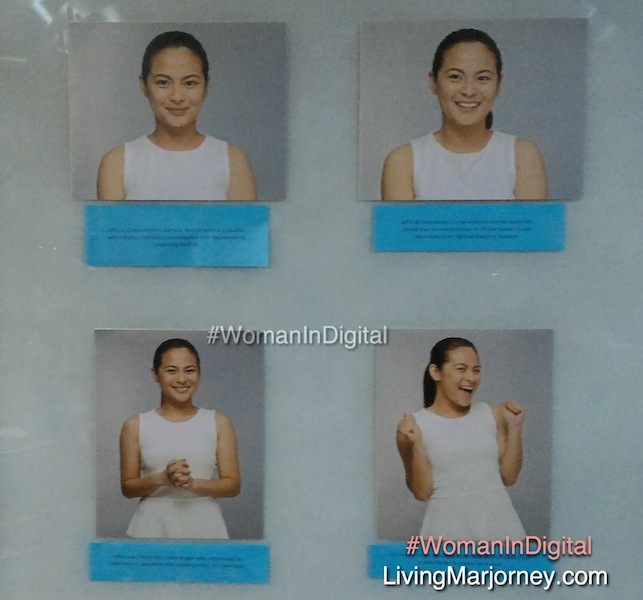 A web-based reality show chronicling the day-to-day life of a real Filipino girl who has started her journey towards "Bagong Ganda, Bagong Pagasa". 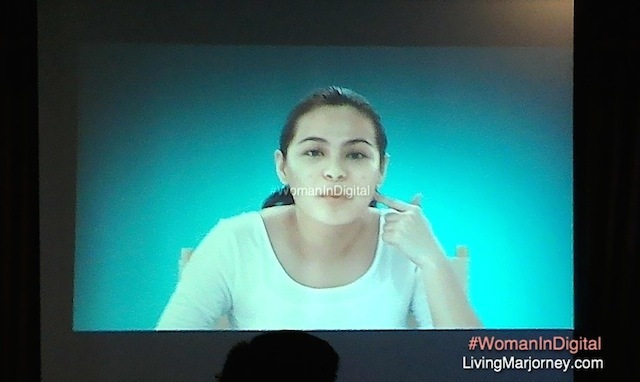 Call it bold, ambitious and ground-breaking, this campaign shifts its spotlight an a girl who has a genuine skin problem (her pimples), and challenges her to try Maxi-Peel products to finally help her achieve better skin. Yes, I have seen the commercial and I thought it was a good and engaging one, promising at the least. but I also believe there would be those who would take this kind of campaign with a grain of salt with the impression of being just a "gimmick". Well, guess what, I met Jefferlyn "BI" Serrano yesterday and I realised that her journey was an authentic one. the personal battle against pimples and how it affects your confidence in life is no trivial matter. Jeff is a regular 20-year-old college graduate who has dreams of making it big as an actress. Talented as she may be. she has yet to be see stardom, nonetheless. One of the barriers she faces in achieving her dreams? Her skin. 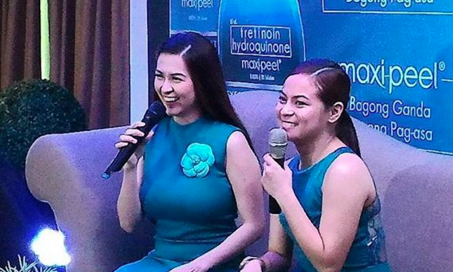 It was revealed yesterday that when Maxi-Peel saw Jeff, she shared her story on how her once clear skin has fallen prey to pimples and acne. As the number of her pimples increased, her confidence in auditions wavered. Another thing about Jeff is her "fan"-tasy about top Philippine celebrity Marian Rivera-Dantes. As Jeff faced the press for the first time yesterday, it was also her first time to meet her celebrity inspiration - Marian Rivera-Dantes. In fact, she was her celebrity of choice when she joined a TV contest impersonating her a few years back. 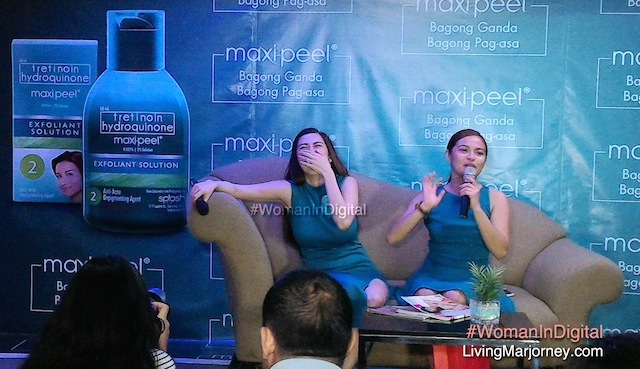 Moreover, Marian Rivera-Dontes is a longtime Maxi-Peel ambassador who has provided inspiration and motivation to many other Maxi-Peel users. In this #TunaySerye, Jeff is given the chance to regain what she once lost and more. Catch her daily posts and interact with her through the Maxi-Peel Facebooh page. 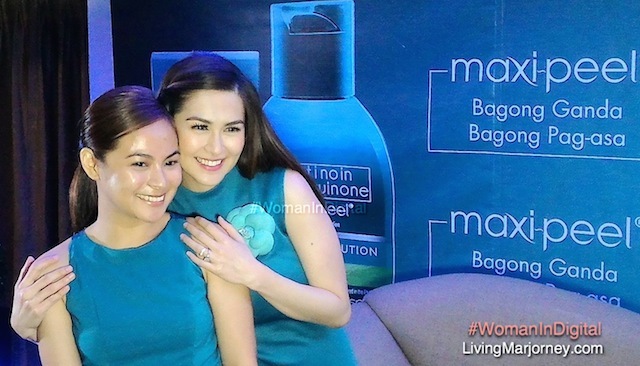 On their Maxi-Peel Journey, together. Get educated on the proper usage of the Maxi-Peel day and night regimen as well! Watch her as she attends and takes part in live photo-shoots and guestings in the next few days! So for the curious cats, let's join in and bear witness as new skin, new beauty, and new hope unveils right before our eyes and the public.